The UV stabilised fine grade mesh Fruit Tree Sleeves are supplied on 10m rolls and works by covering branches laden with fruit just starting to form, just slide the sleeve from the pack, cut off required length with scissors and secure to branch with the releasable cable ties supplied. Invented by one of our customers, the re-usable 10m Harrod Fruit Tree Sleeve Roll comes complete with quick releasable cable ties is a great way to protect precious cherries and other fruit from birds, aphids and adverse weather. As well as encouraging faster ripening on individual branches, there is also a cost saving on the expense and effort of erecting a fruit cage over numerous trees. Harrod Fruit sleeves can be used on a variety of fruits including cherries, peaches, grapes, figs & plums etc. Use as much of the sleeve as you need for individual fruits, clusters or whole branches, even over a metre long. The UV stabilised fine grade insect mesh sleeve is supplied on a 10m roll with two size options available 17.5cm Dia. or 30cm Dia. and works by covering suitable branches laden with fruit just starting to form. Simply slide the sleeve from the pack and then cut off the required length with scissors at the end of the branch. Leaves need to be carefully inspected and any existing problems treated before being covered with fruit tree sleeves and inspected at regular intervals. Both ends of the sleeve are then clamped with the supplied releasable cable ties to achieve end to end branch protection. When cherries are ripe, simply release the ties, slide off the sleeve for use next season, and harvest your sweet tasting, undamaged fruit! Suitable for covering cherries, peaches, grapes, figs & plums etc. Package received well and in good time. The fruit tree sleeves are very good. I am very pleased to say they not stopped the birds and cherry fly, but they have kept my cherries in good shape meaning I've just picked the last of my crop on the 16/07/18!! The uncovered branches and turned months ago. 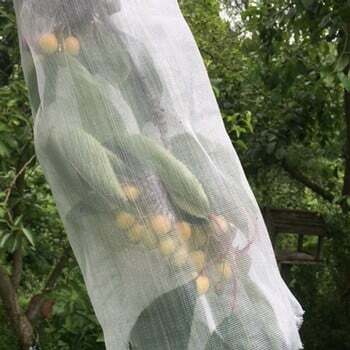 Ten years I have had no cherries due to Pigeons - this year, after purchasing the branch nets, I have had hundreds - totally recommended, with quick release cable ties included, delivered quick and brilliant product at good price. Thank you for your wonderful cherry sleeves which I purchased last year. 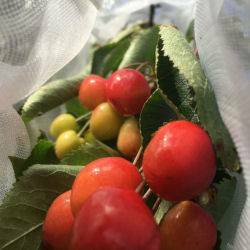 In my garden it is vital to install protection long before cherries ripen as birds peck off the fruit just as they begin to swell. At this stage there is still a lot of brown debris around the bunches, from the buds and flowers. Instead of tying the sleeves at both ends as the instructions say, I just tied at the top, and used a safety pin at the other end as I reckoned that even a clever crow wouldn't be able to get past that. This not only meant that I used less material per bunch, but also I was able to shake the debris out of the bag as it loosened. 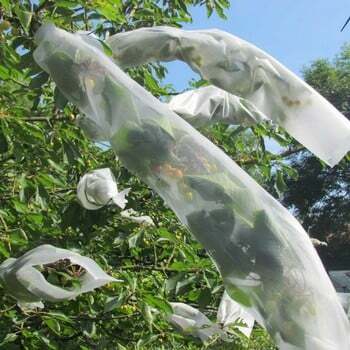 Previously I had made individual gauze bags which did protect the cherries, but meant they were developing in a mass of rotting brown matter, which wasn't ideal. My safety pin method with your sleeves worked admirably. Kept my eye on the cherries this year, again! Decided to leave the sleeves off till late June as the weather has been exceptionally wet! Noticed a lot of Ant activity on the tree - bad news as they farm cherry black fly. Earlier in the year I had put Grease bands on all my trees. 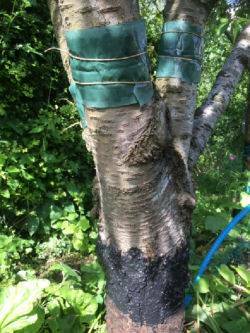 I used fruit tree grease & noticed ants had crossed the barrier, as a result I reapplied a thicker coat of grease and fitted Grease Bands, higher up on the tree, as the attached pictures shows. £21.95 for a 10m x 17.5cm Dia. roll which equates only to £1.95 per metre. This represents very good value; cost effect and economical. 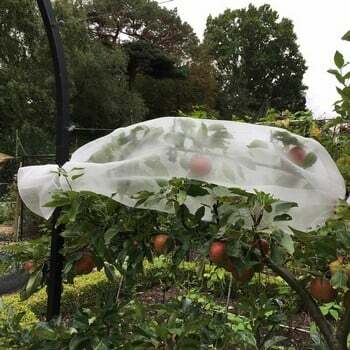 One pack of Fruit sleeves is sufficient for a large to medium sized tree, allowing the birds to share the more inaccessible fruit! 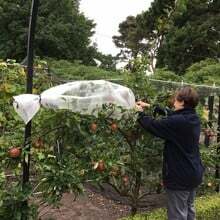 Fruit sleeves are re-useable & are easy to remove to inspect the fruit for pest and diseases. To apply, just cut to the required length, not every branch on a tree is a is a metre long! Fruit sleeves can be used on a variety of fruits including peaches, grapes, figs & plums etc. Use as much of the sleeve as you need for individual fruits, clusters or whole branches, even over a metre long. The beauty of the fruit sleeves is their simplicity. They are quick and easy to fit, I've timed fitting at under a minute for some branches. There is no fiddly tying, no strings just simple reusable clips, which are attached on one end or either end if needs be. Just cut to length allowing extra for tying to the top of the branch and at the bottom of the the sleeve, if required. Once cut to length slide the sleeve on to the branch, as you would with an ordinary "sleeve", as simple as that! • Fruit must be free from disease or pests before use. 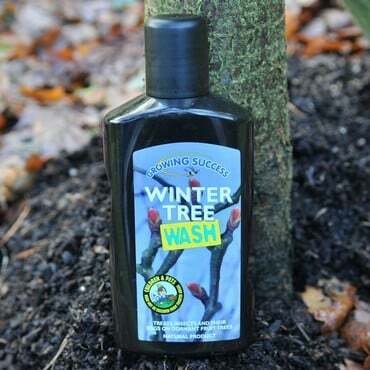 • Apply grease bands or apply tree grease to trees trunks to prevent insect pest climbing the tree. These bands need to checked fairly regularly, as ants can cross these barriers if not they are fitted correctly or are deteriorating. • Aphids are quite easy to spot, usually on the underside of a brown curled leaf, damaging the leaves. • Inspect fruit sleeves regularly to detect any early signs of pests or disease. • If the ends of the sleeves are left open it is easy to clear out any detritus that may have accumulated. • When fitting the sleeves there is an opportunity to prune dead or diseased wood. Cherries are looking good so far! Here's hoping for a nice early, clean crop.